"Front Porch Cinema": Free Movies at Santa Monica Pier - Yo! Venice! 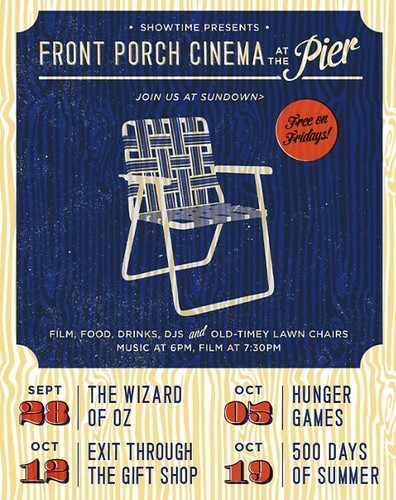 The Front Porch Cinema Series at the Santa Monica Pier begins this evening at 7:30 pm with a screening of The Wizard of Oz. Before the screening, there will be music starting at 6 pm. The series, which is open to the public and FREE, runs until October 19th. The films are projected onto a 40-foot airscreen with a digital high-def projection system. Food carts and refreshing cocktails in the Cinema Lounge will be available. Attendees are encouraged to bring their own chairs, as a limited number will be available for rent.